As Store 44 Reps gears up for our annual portfolio review, here are some tips to keep in mind when you are sending your artwork to prospective agents or buyers. Message Subject: "Greetings from Ohio! ", "Inquiry", and "Bop Sniggity Shabam!" are not in any way helpful. Your Message Subject, along with the sender's name, is the first thing most art buyers and reps are going to read. They could even be your last words, so make them profound. Or at least keyword rich. Try, "New Sports Photography from Erik Isakson", "Book Cover Illustrations by Carlos Araujo", or simply, "Artist Submission". Now we know what we're going to see, and it's easy to search for. Message Content: It should match your Subject. For an artist submission, most agencies* will require your submission meets certain criteria. You should be able to submit a half dozen stylistically connected images of your best work. These should probably be JPGs. You may be required to include a CV, Resume, and a client or gallery list. These documents should be attached as PDFs. Most modern browsers will pop open a PDF in a new window. Attaching Word Docs can require extra steps some people don't want to take. Plus there can be compatibility or security issues with that, too. That's also why we advise against zip folders. Just JPGs and PDFs. Now you have about a paragraph of text where you are going to combine a bit about your particular style, what makes you unique, along with the highlights of your artist statement, client list, and gallery shows. The goal is to put together a brief introduction, and to include keywords in your email that represent your work, style, location, etc. This information is very important for searching and sorting through emails. Be sure to include links to your work in addition to attachments. Your Website: Have a meaningful web address as your main online presence. Even if you have to redirect it to a portfolio site or a blog, register a domain name for your artwork, and hang on to it! Ideally, this should be a professional name, and not something cutesy. You may outgrow "Happy Frog Illustrations" one day. 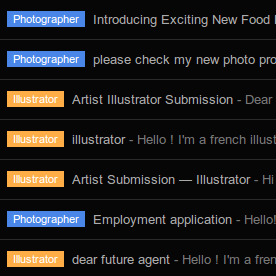 yournameillustrations.com shows you are serious about your work. Your Signature Line: Your submission should close with a signature line. All of your contact info, social networking links, and probably most important, your website address, laid out in an easy to read little blurb. Every email you send should have a signature line. If you don't have one yet, make it a priority. Don't make potential agents or clients search for your contact info. Here's a quick tutorial for setting up signatures in Gmail. Keep Them Updated: Email newsletters are acceptable for some agencies, but make sure you don't abuse it by sending too many emails. The goal is to keep people informed and up-to-date. Cross that line and they may unsubscribe or mark you as spam. Save your emails for important messages, when you update to a new website, when you finish up an assignment for a big client, or for a gallery show invitation. Keep it professional. If you are sending email newsletters, make sure you are in compliance with anti-spam laws by using a service such as Vertical Response or Constant Contact. Keep Trying: Artist rep agencies can receive hundreds of submissions in a week. Emails, postcards, and portfolio reviews. It's not always possible to respond to every submission, so don't be discouraged by form letter rejections or complete silence. Rest assured someone is looking. And when you have a new collection of images, be sure to update the art reps you are targeting. Persistence is important. Part of their job is to be aware of all the amazing talent out there. Good luck! We look forward to seeing your work.